Our team can design and run company events and trainings to build up teamwork at any location in Bulgaria and abroad. You could point us a desired area and preferred season, and we can tailor a program under these parameters. The other option is: We offer a place for the particular event, where it could be more attractive, engaging and beneficial for the participants. Programs that take place outdoors require careful consideration of the natural resources, season, specific climatic and water conditions. A great teambuilding is achieved when the exercises and logic of the program are designed for an area whose relief, natural resources or archaeological monuments are a natural factor for the success of the event. For example, if the participants are staying in Ribaritsa, a better choice for an adventure teambuilding area would be the canyons and caves near the village of Karlukovo, than the meadow in front of the hotel. In this context, our idea is to offer the best program at the most attractive location, closest to the business location or hotel you have chosen to stay at. We have divided Bulgaria conditionally into several types of areas that are suitable for corporate events in the open and can be chosen according to the season. The Lakatnik Rocks - the place is located in the Iskar Gorge 60 km north of Sofia. Prohodna Cave - a natural phenomenon near Lukovit. The bridge of God - canyons, a cave and a medieval fortress, located near Vratsa. Dryanovo Monastery - a very suitable place for a winter teambuilding program in the central part of northern Bulgaria. 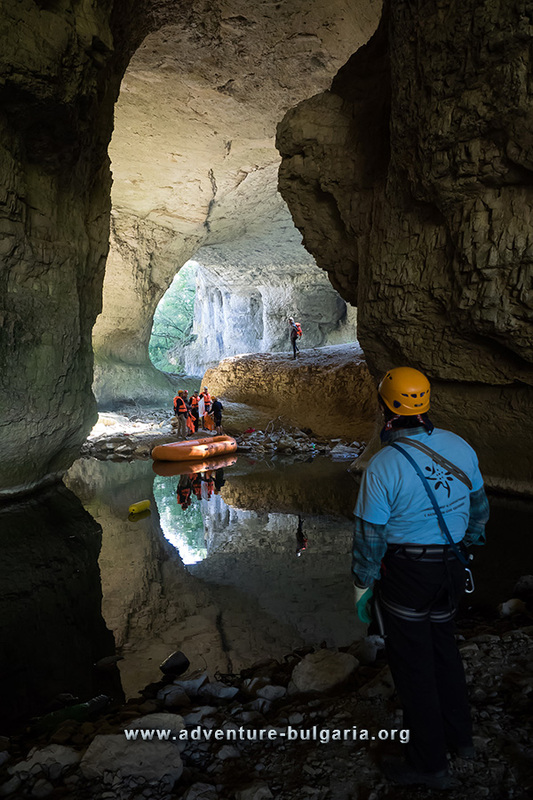 Team exercises with vessels in an underground lake or in winter conditions can also be organized in a comfortable for the participants’ way. A region suitable for this purpose is the Devetash karst plateau. We can also build a teambuilding event in a swimming pool. An excellent place for this purpose is the Open air mineral water pool of Sandanski. Rivers: The exercises that take place in water with current have a strong focus on synchronization, fruitful communication, the ability to make quick and adequate decisions, leadership ... An event involving kayaking or rafting gives every teambuilding great efficiency. The rivers that we are conducting those programs are Iskar, Yantra in the vicinity of Veliko Tarnovo, Arda in the region of Madjarovo, Veleka and Kamchia in the coastal zone and of course Struma River in the Kresna Gorge, Kozhuh Mountain near Sandanski or the gorges of Konyavska Mountain, which are close to Kyustendil and Dupnitsa. River programs are held comfortably from May to October and are dependent on precipitation not only in the area but also in the mountains. 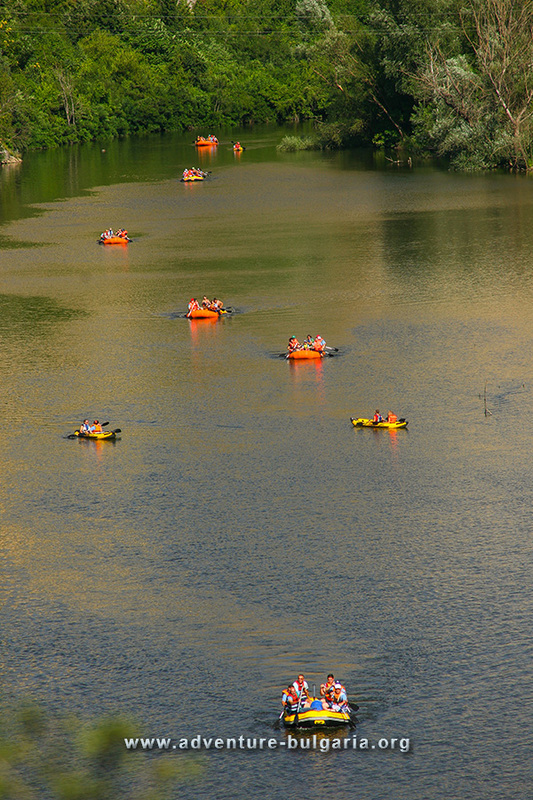 In this context, the series of dams in the upper course of the Iskar River give a smooth outflow of the river, even in the case of heavy rainfall, making the area of The Lakatnik Rocks an excellent place for company events, including rafting or kayaking in all weather and seasonal conditions. We also offer a several days’ adventure program in Greece, along the Mesta River, which can be finishing on the Aegean coast near the Island of Thassos. Sea programs: They cover the Bulgarian and Greek sea coasts and can be conducted in popular resorts or wilder places such as Kamen Bryag, Tyulenovo, Kamchia or Sinemorets. Maritime programs that take place outside the active tourist season allow lower hotel prices and organising the games on most of the beach. River estuary areas, such as Veleka, Kamchia or Albena, favor including water exercises into the training regardless of the sea's condition. Example for a Sea program is the “Pirate Flag”. Historic Fortresses: These programs can be conducted among the natural décor of the Proto-Bulgarian fortresses. Tarnovo Tsarevets, the fortresses of Lovech, Belogradchik or the Eastern Rhodopes are just some of the possibilities. An obligatory element in such an event is the logical game generated on the basis of real historical events and facts. These programs are in the lower part of Bulgaria and can be carried out all year round. An example is the “Tsarevets Fortress”. Mountain Areas: "Getting Together to the Top ..." This is the moto of our team, which we have often experienced when climbing the mountains of Europe, Asia, South and North America. The "hard" mountain conditions are a faithful test of human character and a powerful catalyst for teamwork. To adapt the event to people who are used to everyday office life, we have designed one-day and two-day programs that develop the teambuilding idea in mountainous conditions. If you prefer the hotel bases of Bansko, Borovets, Pamporovo, Velingrad or Devin, depending on the season and the weather, we will offer you programs in the low or high mountain range. If the large resorts style is not of your taste, we can offer you small and cozy tourist facilities in suitable locations. Atmospheric conditions have a strong impact on mountain events, and it is recommended to have events during summer, early autumn or under stable snow conditions. An example program in this category is “Mountain Echo”. Interesting adventure programs in winter can be held in the area of The Lakatnik Rocks or Dryanovo. 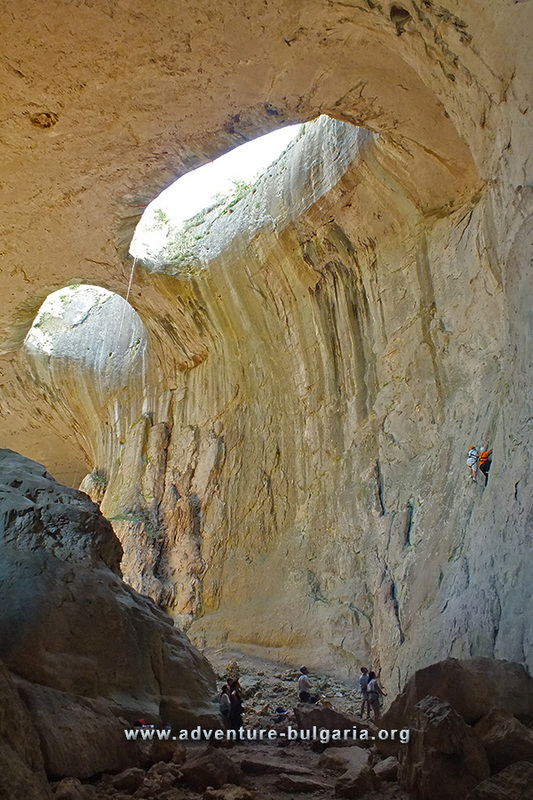 Some of the exercises in these places can happen in caves where it is warm and dry during the winter season. If there are requirements for the program to include skiing or other elements of winter sports, we can also run a program near popular winter resorts. Very suitable places for winter skiing in mountainous conditions are the areas of Malyovitsa or the Seven lakes in the Rila Mountains or the surroundings of Bezbog hut in the Pirin Mountains. 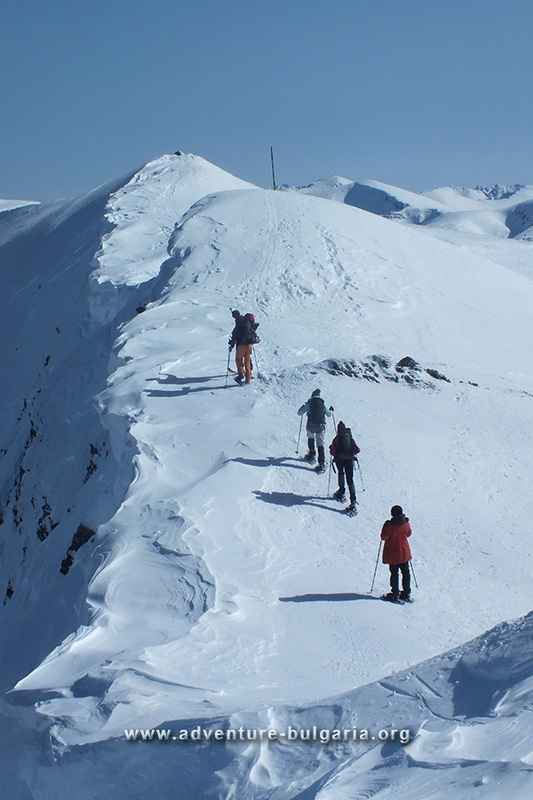 We can also offer suitable places for winter teambuilding, in proximity to resorts such as Bansko or Borovets.